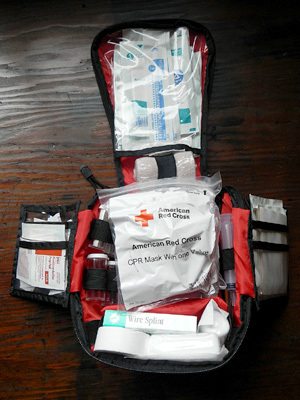 A Wilderness First Aid Kit can greatly improve your chances of survival when disaster strikes. The wilderness can be an unforgiving place. It is prudent to be prepared. In this article I am going to talk about how to put together a good first aid kit for the wilderness, and share with you what we, at Alderleaf Wilderness College, carry in our first aid kits. 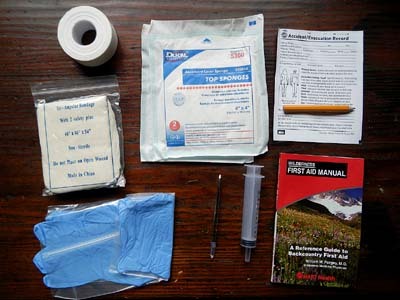 In order to build a good wilderness first aid kit, we must first think about what types of injuries we are likely to encounter in the wilderness. 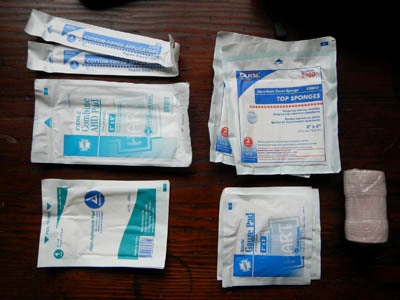 It is important to have supplies for bleeding injuries, internal ailments, and bone/ligament injuries. Bleeding injuries require something to absorb the blood (gauze), something to clean the wound (anti-bacterial wipes), something to close and protect the wound (butterfly bandages and band aids) and finally something to lower the risk of infection (antibiotic ointment). We can include burns in this category which are also treated with ointment. Internal Ailments include digestive issues, headaches, nausea, allergies, bug bites, and rashes that may be caused by plants. These ailments are treated with lotions and medicine. Bone and Ligament Injuries and other common hiking pains such as blisters are treated with splints and wraps. In the case of blisters, mole-skin or duct tape is very effective. We always include an ace bandage, some type of fold-able splint, and triangular cloth like a bandana for making a sling and other movement-restricting devices. Thinking in terms of these three categories is a simplification that may be useful as you decide how you want to build your first aid kit. 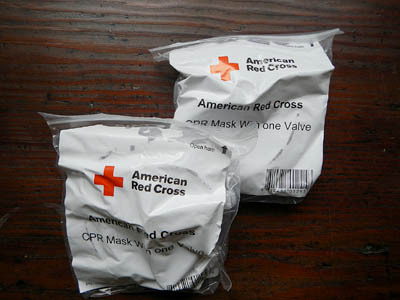 We carry two CPR masks endorsed by the Red Cross. 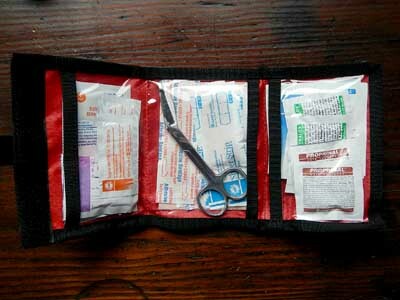 Inside the large Wilderness First Aid Kit we carry a smaller one in case the group must split in times of emergency. This way both groups will be equipped with basic first aid supplies. It is always nice to have a reference manual when in the field. We carry "The Wilderness First Aid Manual" by Dr. William Forgey and also two accident/evacuation records and a pencil. We also carry latex-free medical gloves, a syringe to irrigate wounds, tweezers, a large cloth for making slings, tape, and gauze. We carry triple-antibiotic ointment packets, sting relief wipes, povidone-iodine wipes, antimicrobial hand wipes, and hydrocortisone cream packets. 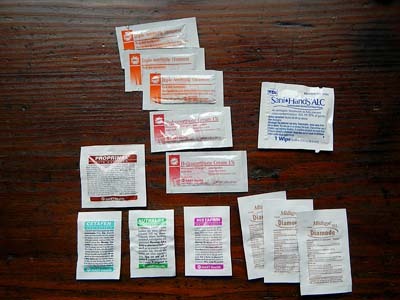 Medications that we bring include antacid tablets (for heartburn, indigestion, upset stomach), ibuprofen tablets (aches and pain), acetaminophen tablets (non-aspirin pain reliever), diphenhydramine caplets (antihistamine), and loperamide caplets (for diarrhea, especially due to contaminated water). 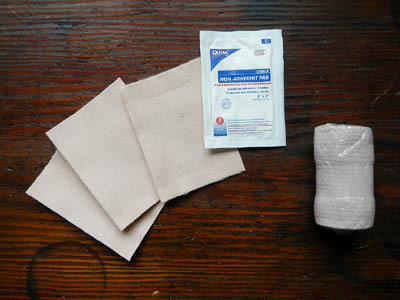 For wound care we bring 3 x 0.75 in. adhesive bandages, 3 x 1 in. 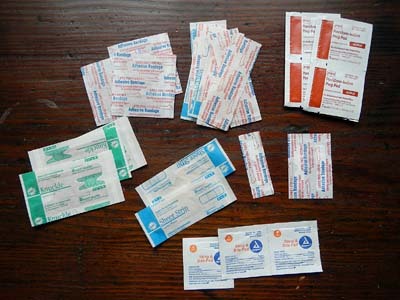 adhesive bandages, knuckle adhesive bandages, fingertip bandages, butterfly closures, sting and bite pads, and iodine prep pads (for cleaning wounds). On top of that we bring 2 x 2 in. gauze pads, 3 x 3 in. gauze pads, a 3 x 2 in. non-adherent pad, and 4 x 4 in. sterile top sponges, q-tips and an ace bandage wrap. 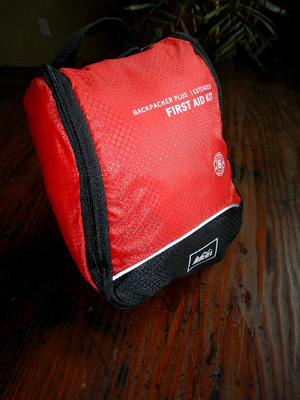 As a final note – a first aid kit is only as helpful as your ability to use it. 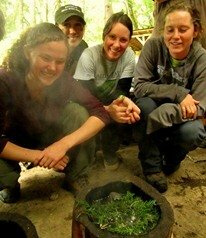 We recommend that anyone spending much time in the outdoors gets Wilderness First Aid training or more intensive Wilderness First Responder training. I hope this was helpful to you as you build your Wilderness First Aid Kit and hope it increases your chances of a safe and pleasurable experience in the outdoors. Remember the wise words of Ben Franklin: “An ounce of prevention is worth a pound of cure.” Good luck and safe travels!